From the first meeting until final sign-off, we’ve already looked at the Jarrods’ approach in detail. But what actually happens on the day of your staircase installation? What can you expect in terms of timescales? How does the process unfold? We pride ourselves on a 48 hour staircase installation for the majority of our staircases. But what can you expect to happen within those 48 hours? Well, make yourself a cuppa and settle back. We’re going to answer all your questions and break down the entire process step by step. Generally, our team will arrive between 8am to 9am, but you can request a specific time if it’s more suitable for you. We do ask that our clients remain on site while the staircase is renovated or installed. It’s good to have feedback on some of the finer details of the installation. Since some of the minor design features can be open to interpretation, we think it’s helpful for our customers to be around. This helps to ensure that your new staircase is everything you’ve dreamed of. Of course, we’re not going to have you on house arrest during the 48 hour staircase installation! Many of our customers do venture out to the shops or into work for an hour or two. After our joiners and installation team have introduced themselves, they’ll get to work on setting up their liveried canopies outside. If you have a driveway, this will often act as the set-up location so it’s worth considering whether you need to find alternative parking. The canopy will house all of the tools needed for the work to take place. As for the components of your new staircase, we’ll ask you to choose a designated area where we can store these. It could be a spare bedroom, the hallway or even your garage. This is where the hard work begins, for our installation team at least! 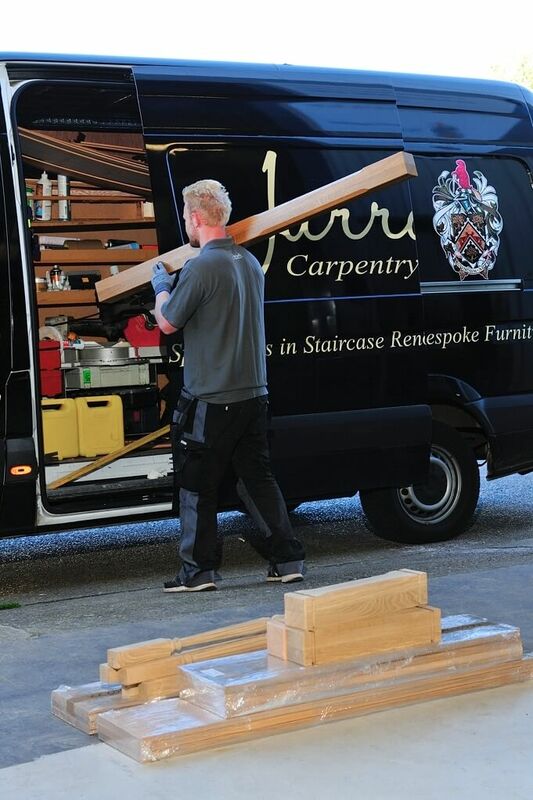 Depending on whether you’re having an entirely new staircase or a renovation, we’ll either remove the whole staircase or the components that are being replaced. Of course, what’s removed will depend on the style of the staircase that’s being installed. It’s worth noting that during a staircase renovation, the actual staircase and the structural parts will remain in place for your convenience. This means that you’ll still be able to access the upper levels of your home should you need to. Now that the old staircase materials have been removed, we can start turning your dream vision into a reality. Most of the craftsmanship will have already been completed in our workshop. This minimises the mess in your home and ensures that there are no surprises or delays to your staircase installation. 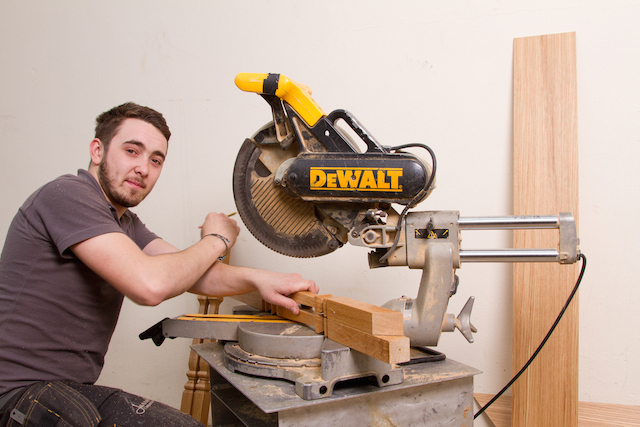 However, our installation team will more than likely have to cut some woodwork to size on site. This will be done using the tools in the canopy outside. If you’re having glass elements in your staircase, this will have been completed in the workshop. At this stage, it becomes more of a case of just assembling the staircase, much like building a 3D puzzle. Voila, the 48 hour staircase installation is complete. Your new staircase is now in place. All that’s left is for our team to polish and wax the staircase so it’s ready for you to show off to your friends and family. We’ll have a good clean, hoover and tidy before showing you the finished result. At this stage, we ask that you take a careful look at the staircase to ensure that you’re 100% happy with it. If something isn’t quite as you expected, don’t be afraid to tell our team. They’re an understanding bunch and will want your new staircase to be everything you want it to be. If you do pick up any minor issues, our team will be more than happy to fix this before re-polishing. When you’re as happy as we are with your new staircase, we’ll contact our office to state that the work is complete so we can take the final payment. And after a quick handshake, that’s pretty much it. You’ll now be left to enjoy your new staircase in peace. And all the time you can be safe in the knowledge that we’re only a phone call away should there be any problems. 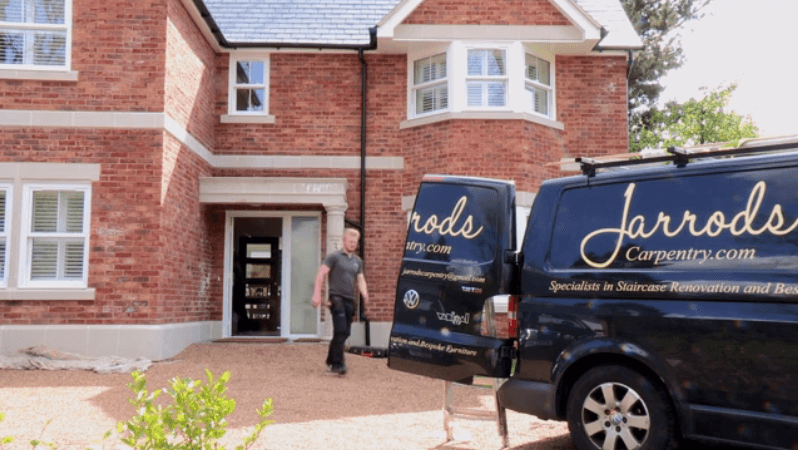 If you want to talk to us about a 48 hour staircase installation, give us a call.